It’s the birth date of Will Eisner (1917–2005), Will Eisner’s Shop Talk. Happy birthday Ellen Schecter (The Warrior Maiden), Thacher Hurd (Art Dog), Kathleen Hague (Alphabears), and Christopher Raschka (Yo! Yes? ). The artist Michelangelo (1475–1564) was also born on this day. Read Michelangelo by Diane Stanley. It’s the beginning of Celebrate Your Name Week. Read Borrowed Names: Poems about Laura Ingalls Wilder, Madam C. J. Walker, Marie Curie, and their daughters by Jeannine Atkins, The Named by Marianne Curley, and Someone Named Eva by Joan Wolf. It’s also National Pancake Week. Read Pancakes, Pancakes! By Eric Carle and Pancakes for Breakfast by Tomie dePaolo. This week has been designated Write a Letter of Appreciation Week. Consequently, I will use this essay to send a note to Rebecca Stead about her novel When You Reach Me. Many of my readers have probably already picked up this Newbery Medal­–winning book, which is clearly on its way towards becoming a classic. But if you have not read it twice or even multiple times, I would suggest that you do so. With an incredibly intricate plot that fits together at the end like a jigsaw puzzle, the book seems more brilliant to me upon each reading. On some level, When You Reach Me stands as a love letter from one author, Rebecca Stead, to another, Madeleine L’Engle. A discussion of A Wrinkle in Time and its plot intertwined throughout Stead’s story provides some hints about what might really be occurring in When You Reach Me. 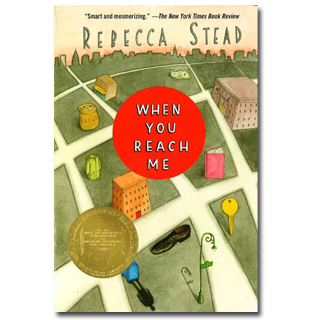 It is often said that the best children’s writers leave an enormous amount to the reader’s imagination—and Rebecca Stead excels in this area. She does not overdescribe; she leaves room open for individual interpretation. But upon examination, the seeming simplicity of her language is misleading. For in every chapter, Stead scatters clues like a skilled mystery writer. Although I know how Rebecca Stead will pull all the details together, I still get a chill each time I read the chapter titled Magic Thread. Ambiguity, time travel, different events having multiple meanings—all these stand at the heart of this complex novel. In this letter of appreciation, I want to thank Rebecca Stead for having faith in the intelligence of young readers. I am so grateful that this loveliest of children’s book writers decided to leave the legal profession and devote her life to writing for the young. I am so glad that Rebecca Stead reached us! Losing Sal was like a long list of bad things, and somewhere in the top half of the list was the fact that I had to walk home alone past the crazy guy on our corner. He showed up around the beginning of the school year, when Sal and I still walked home from school together. A few kids called him Quack, short for Quackers, or they called him Kicker because he used to do these sudden kicks into the street, like he was trying to punt one of the cars speeding up Amsterdam Avenue. Sometimes he shook his fist at the sky and yelled crazy stuff like “What’s the burn scale? Where’s the dome?” and then he threw his head back and laughed these loud, crazy laughs, so everyone could see that he had about thirty fillings in his teeth. And he was always on our corner, sometimes sleeping with his head under the mailbox. Originally posted March 6, 2014. Updated for . I’m thrilled to see this book reviewed. I was expecting it. I came to children’s books mostly as an adult, and that was shepherded by the guiding hand of Anita Silvey. This is an extraordinary book.and it’s one of the rare children’s books I know about, which I did not first learn about from Anita. But that was only because of timing. Rebecca Stead, you have yourself a lifetime customer. Such a great read – I actually finished reading this book for the first time last night and loved it! I initially expected a very realistic tale, and instead, I was blown away by Stead’s intricately crafted story that grapples with everything from adolescent friendships to solving a mystery to time travel. This brilliant novel clearly demonstrates Stead’s her trust in her readers, and that’s a beautiful thing. Thanks Grace and Gordon for the comments. As I was writing the essay, Gordon, I was thinking about all the people who have been so deeply touched by When You Reach Me and thought of you. We read some books — and others change our minds, hearts, and lives. I was reminded that I need to read this book again and this time to try to get the references and fit all the pieces together, as Anita mentioned. I read this book in one sitting, only taking a break to use the bathroom. So many unexpected moments. I recommend this to students all the time, but sadly they don’t seem to enjoy it as much as I did. I do know teachers who used it as a class novel and had kids who fell in love with it, so I’m hopeful. I read this as a children’s literature specialist, and I loved it. I had my grown daughter, a very literal person, read it too and she said to me “now I know how time travel works.” I’ll never forget that. What a special book.